Features: Just how influential is Ireland's Brian O'Driscoll? In this edition, John answers a host of queries on the Six Nations with mascots, coaches, France, father/son combinations and also on the southern hemisphere's influence in the northern hemisphere. Which team was the first to present mascots at a Five/Six Nations Championship match? Although it is now customary for each member of the match-day squad of 23 to have his own mascot when sides come out before kick-off, a trawl through past team photographs shows that as early as 1922 Wales adopted a mascot when they were tilting at the Championship title. After beating England at Cardiff and drawing with Scotland at Inverleith, the side faced Ireland at the St Helen's ground in Swansea in March. The team was photographed for that match with a young girl-mascot dressed in Welsh national costume. She brought them good luck during a barren period for Welsh rugby. They won 11-5 and went on to beat France in Paris to win the title - Wales's only outright Championship success between 1911 and 1931. The organisers at St Helen's repeated the practice a few years later with a young lad as their mascot, but on that occasion they were heavily defeated by the Scots. What are the winning percentages of the current Six Nations coaches? 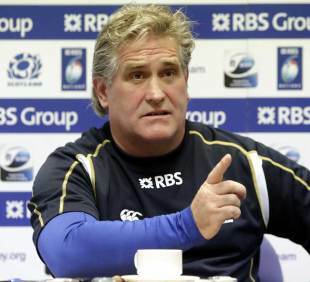 Scotland's win against Ireland on Sunday gives Scott Johnson the best winning percentage of the current coaches. When was the last time France made seven (or more) changes during a Five/Six Nations season? The only time since the Six Nations began in 2000 that France had effected more alteration to a starting fifteen during a Championship season was in 2008. Coach Marc Lièvremont announced nine changes to the run-on side that faced Italy after a 24-13 defeat by England in Paris. That was soon after he succeeded the colourful Bernard Laporte as head coach, Lièvremont memorably shuffling his sides like a deck of cards. During the inaugural Six Nations in 2000, France had also made seven changes in personnel to face Ireland after winning 28-16 against Scotland. France lost 27-25 - the first Irish victory over the French for 17 years and their first in Paris since 1972. The French were famously fickle in their Five Nations selections in the late 1960s and early 1970s. They managed ten changes in 1972 after losing 14-9 to Ireland in Paris. Béziers, with a strong forward-oriented game, were the most successful side in the domestic championship and for the matches against Scotland and Ireland at the start of that Five Nations the French selectors had turned to the club. After successive defeats, however, wholesale changes were made for the Paris visit of England and Alain Estève was the only one of the seven Béziers players who survived the axe. Jo Maso returned at centre in a revamped threequater line, the props were dropped and a new back-row was selected. France proceeded to a memorable 37-12, six-tries-to-one win. It was their then-highest score in the Championship and turned out to be the last Test staged at Stade Colombes. Drastic action had rescued them from a whitewash in 1969 - their last winless year in the tournament and the last time they were left outright holders of the Wooden Spoon (though they were joint-bottom in 1999, 1982 and 1980). They lost to Scotland, Ireland and England in 1969 before changing nine of their team to meet Wales in Paris where they forced an 8-all draw that was to deny Wales the Grand Slam. France also made nine changes after losing to England at Twickenham in 1973 and went on to beat Wales 12-3 in Paris when the Five Nations uniquely finished in a quintuple tie. How many sons of fathers capped by a different Home Union or Tri-Nations country have appeared in the international championship? Father/son combinations capped by the same country are relatively rare but Antonie Claassen's appearance for France at Twickenham last weekend brought to five the number of Championship players whose fathers had been capped in Tests played by the Home Unions or Tri-Nations. Claassen's dad, Wynand, had the rare distinction of leading South Africa on his Test debut against Ireland in 1981 and won all seven of his caps as captain. Another father of sons capped in the Five/Six Nations shared this very rare distinction. Andy Leslie skippered New Zealand on his debut in 1974 and like Claassen led the All Blacks in all the matches of his Test career. Leslie's sons, John and Martin, were capped by Scotland between 1998 and 2003. The only instance of father/son playing for different Home Unions was the Vickerys from Aberavon. Father George was a forward who played for England once (against Ireland) in 1905. His son, Walter, played in the Welsh back-row four times in Championship matches between 1938 and 1939. The other examples were involved in series against the Lions. Clive van Ryneveld senior played for South Africa against Tom Smyth's side in 1910 and Terry Lineen for New Zealand against Ronnie Dawson's tourists in 1959. Clive van Ryneveld junior was a strapping centre for England in the 1949 Five Nations and Sean Lineen, also a strong-running centre, played for Scotland between 1989 and 1992. Other father/sons with cross representation beyond the limits set in the question include Mako Vunipola and Toby Faletau, who are sons of fathers capped by Tonga, while the 1936-38 All Black Test prop Everard Jackson was the son of Fred Jackson who played in a Test for the 1908 Anglo-Welsh tourists against New Zealand before settling out there. Since 2000, how many players of Tri-Nations or Fiji/Tonga/Samoa birth/heritage have played for each of the Six Nations? Italy have used 26 players of Tri-Nations or Fiji/Tonga/Samoan birth/heritage and England 23. Ireland have called only seven and France have used only six, though this figure excludes those from French-speaking territories such as Wallis-and-Futuna (J Suta, R Taofifenua and C Tolofua) and New Caledonia (S Vahaamahina).